I bet many of you remember brand called Audio Aero, right? This French company based in Toulouse was famous since 1998 for their CD Players. Names such as Capitole Reference and Classic, or their latest products, highly acclaimed La Fontaine and La Source should definitely ring some bells. Even though the company doesn’t exist anymore there are still music lovers (I know a few) who keep these components in their systems and wouldn’t even think about replacing them, not because of some sentiment but based purely on their performance. It was a sad day for many audiophiles when the news broke of Audio Aero going out of business. 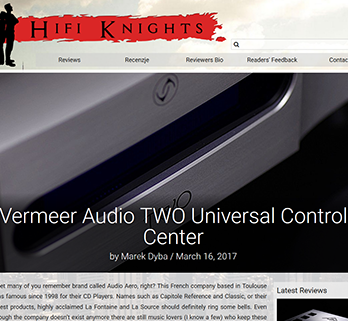 Fortunately it didn’t take long before we learned that another, Lyon-based French company, Vermeer Audio, acquired Audio Aero in the late 2014. The owners of La Fontaine and La Source were happy because the latter company took over service of those devices. Others who missed they chance to buy one of those outstanding digital sources received another chance. Well, obviously Vermeer Audio does not sell neither La Fontaine nor La Source, but based on these products they created their own, intended to deliver even better performance. 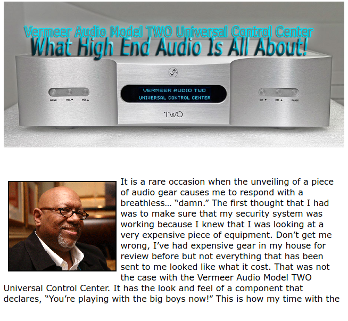 The first model introduced to the public is called simply the Vermer Audio TWO. There are two more models coming on the near future – the top-of-the-line ONE, and more affordable THREE.